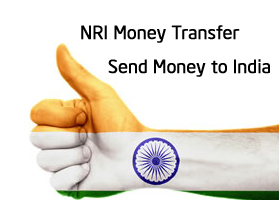 NRI Money Transfer – NRI working abroad settled in the USA, UK and Canada have one important task at all time – sending money to India. It is sometimes observed that they struggle hard to send money to family. They are not aware of various options, the time taken by transfer, exchange rates, and fees charged. In order help, them here is complete guide exploring various options for sending money to India. There are multiple options for NRI to send money to India. They can do a wire transfer, TT, agent-based transfer, online transfer to send money. Availability of these options depends upon from which country you are sending money to India. Bank wire transfer is an offline method for money transfer. This wire transfer mechanism works with the use of SWIFT code. For wire transfer, it is mandatory to have a bank account with the bank through which you are sending the remittance. The time taken by the bank for wire transfer depends on the bank. If you are sending funds from the bank which has a branch in India, it will take less time and you may get a discount in fee. If you are sending fund from a bank that does not have a branch in India, it will take 3-4 days for fund transfer. Exchange rate offers by the bank may be fixed or variable. How to do Bank Wire Transfer? You can initiate bank wire transfer from the local bank at the overseas location. You need to give instruction at bank to transfer the money. You need to mention account number, name, address and purpose of remittance. The sending bank sends a message via a secure system using SWIFT Code to receiving bank. This message also contains settlement instruction. Once the correspondent bank receives instruction actual transfer takes place. Under actual transfer correspondent bank collect the payment on behalf of the recipient. A transfer fee will be deducted from the fund and remaining fund will be transferred to the recipient. International Money Transfer is offered by various financial service providers like Western Union Money Transfer, Money Gram etc. This service is available in online and offline mode. Maximum remittance amount cap is 2500$ under this service. The maximum amount paid to the recipient in cash is Rs 50,000 remaining amount shall be paid by cheque. Only 30 transactions can be received by a single beneficiary in a calendar year using this service. A recipient need to produce valid identity proof to receive money. An Identity proof document includes driving license, passport, aadhar card, PAN card etc. How to send money via International Money Transfer Service? In order to initiate fund transfer, you need to visit Western Union / Money Gram office. You need to fill up a form mentioning the detail of the recipient to send the amount. You need to pay principal amount and charges. Once transaction processing starts you will get unique transfer control number or reference number. Thereafter, you need to inform recipient about money transfer and reference number. A recipient visit Western Union/MoneyGram office fill up the form and shows valid identity proof to receive the fund. Money transfer using this service is very fast and reliable. The entire process takes less than 10 minutes. Online money transfer service is the easiest way of money transfer. This service is provided by online service provider like xoom.com, remit2india.com etc. This service is also offered by banks like ICICI bank (money2india), State bank etc. Using online money transfer, you can transfer funds from any foreign bank account or even credit card to any bank account in India. The time taken for transfer of this money is usually four hours. A transaction fee of online money transfer varies from $2.99 to $5. Transaction limit is $2,500 per transaction. If you fulfill KYC norms you can remit up to $9,999. How to send money via online money transfer service? You need to sign up with the online service provider to send money to India. Next step is to provide information about the amount. After that, you need to provide recipient information and detail about how this money will be received. Once you are done with providing the information you can initiate money transfer. Another method for money transfer is international money order, bank drafts, cashier cheuqe and paypal. Kindly compare various money transfer service before initiating the money transfer. Find out the best exchange rate, lowest transfer fees and reliable service. It is advisable to send large amount at single go rather than sending small amounts in multiple parts as you will be paying transfer fees every time you initiate fund transfer. Make yourself aware about maximum transfer limit. Be aware and calculate total cost. Transfer fee charged by money transfer service provider may be low, but exchange rate could be high. Do mathematics before initiating fund transfer. Example – Suppose, you want to send $1000 to India. The company A offer exchange rate of $1 = Rs 65 with $2.99 transfer fees. The company B offer exchange rate of $1 = Rs 65.5 with $5 transfer fees. So go for company which offers better exchange rates. If you are in urgent need of sending money, it is advisable to use online money transfer or International money transfer service. Make yourself aware about liabilities you may face in case funds are not remitted properly by specified date and time. Check about refund policy offered by the service provider. Confirm about hidden charges payable at the time or receiving money or recipient need to pay additional service charge or not. Sending money to India is very easy today. There are plenty of fund transfer options available to NRI. The only task NRI needs to do is to find best money transfer service provider suitable to his/her requirement. I hope tips given here will help them to select the same. Wow,..!!! Thanks for sharing various ways of NRI money transfers. frankly speaking i know only about wire transfers.